It’s that time of the year again in Melbourne – when temperatures drop, rainfall increases and with this brings about the increase in coughs, colds – you name it – together with a tired and lethargic feeling amongst most. This is where the green smoothie can help to combat some of these winter nasties. They say breakfast is the most important meal of the day so why not kickstart your day with a smoothie – which can combine and help you increase your daily vegetable and fruit intake. Starting your day right is a key to a great day and smoothies could be the way to do it! It was James McLoughlin’s move to New York that inspired the creation of Green Press in 2013. It was here in New York that McLoughlin was introduced to green juices and re-ignited his daily smoothie habit. The aim of Green Press is to make the everyday human eat more vegetables – by making them taste great with little effort possible – in order to evolve your palate so that you actually want to eat more veggies and plant based products. Thanks to McLoughlin and Green Press they have created a smoothie book – aptly titled “How To Be a Smoothie Criminal” which contains delicious smoothie recipes in order to help you kick start the smoothie routine. The book also walks you through what fruits, greens, proteins, sugar free sweeteners, super foods and enhancers they recommend you use as well as extra information about each ingredient. You are bound to find a smoothie for everyone in this book – from the chocolate lovers to the peanut butter and jelly fanatics – there is definitely something for everyone. The names of the smoothies are a play on words – such as Pine Kale-ada, Mochin’ on Heaven’s Door, Mjango Unchained just to name a few. You can download the How To Be a Smoothie Criminal from the following link http://greenpress.co/pages/how-to-be-a-smoothie-criminal or alternatively you can email me and I can send you a PDF copy. Check out the Green Press website as well (http://greenpress.co/) – here you can find links to even more delicious and healthy recipes as well some top tips and tricks to stay on a healthy path! You can also SHOP for Green Press juices. If you are in Melbourne you can even visit their store – details just below! T by Luxbite – All About the Tarts! I am a huge sweet lover and when LuxBite first opened, I made the effort to get from the Melbourne CBD on a train to check out the beautifully presented desserts they had to offer. 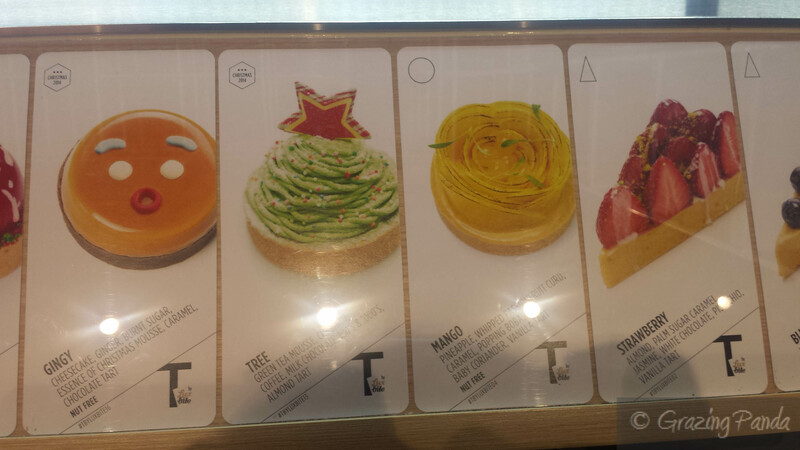 So when I heard about their new venture – T by Luxbite (the T stands for Tarts) – I couldn’t wait to check it out. The creators of South Yarra patisserie – LuxBite – Bernard Chu and partner Yen Yee opened their latest venture last year – T by LuxBite – located in the Melbourne CBD at the new CBD development – The Archway (near the Spencer Street end of Flinders Lane) making them neighbours with Altius Coffee Brewes and 5 & Dime Bagels. Unlike at LuxBite where you can experience macarons and cakes, T by Luxbites main focus is on tarts, emulating their classic French technique and quirky Asian influence – hence the name. The store itself is small, modern and cosy – with only take away available. Each day there will be 10 different tarts available on offer. 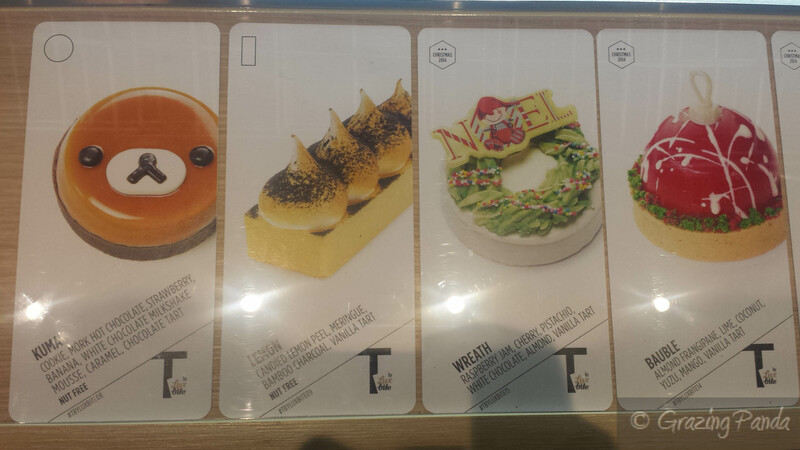 The main showcase is the tarts on display along with signage stating the name and the ingredients of each tart – which allow you to understand the Asian flavour combinations which are certainly interesting. Macarons are also available to be purchased and the larger macaron cakes can be ordered. Some tarts are shaped to look like a common character – such as Gingy from Shrek, Rilakkuma and most recently a Panda to support Earth Hour. The Kuma Tart – Cookie, Mork Hot Chocolate, Strawberry, Banana, White Chocolate Milkshake Mousse, Caramel, Chocolate Tart (and is Nut Free). This tart is way too cute to eat but after one mouthful you will soon get over that and want to keep eating more and more of this tart. The Banana flavour wasn’t too strong, which was what I was worried about and the other ingredients really did work well together. The Caramel was the hero of this tart along with the mousse and chocolate base. The Wang Wang Tart – Sour Cherry Jelly, White Sesame Caramel, Black Sesame Panna Cotta filled Chocolate Tart, Coffee and Hazelnut Praliné Mousse, White Chocolate Glaze. I love the fact that they made this tart to support Earth Hour – such a great cause to support! Once again I was a bit apprehensive of the Black Sesame flavouring being too overpowering – but it wasn’t. The sourness from the jelly together with the sweetness of the panna cotta and the mousse worked really well together. 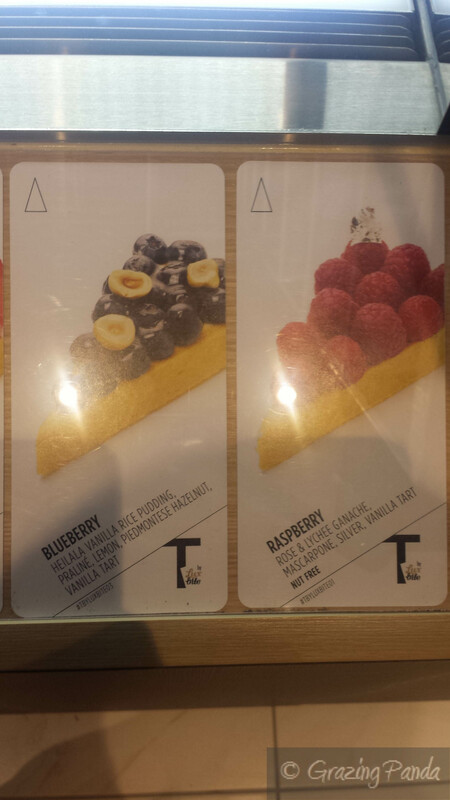 The tarts are colourful, vibrant and bursting with Asian flavours. Tarts are only sold in takeaway boxes. 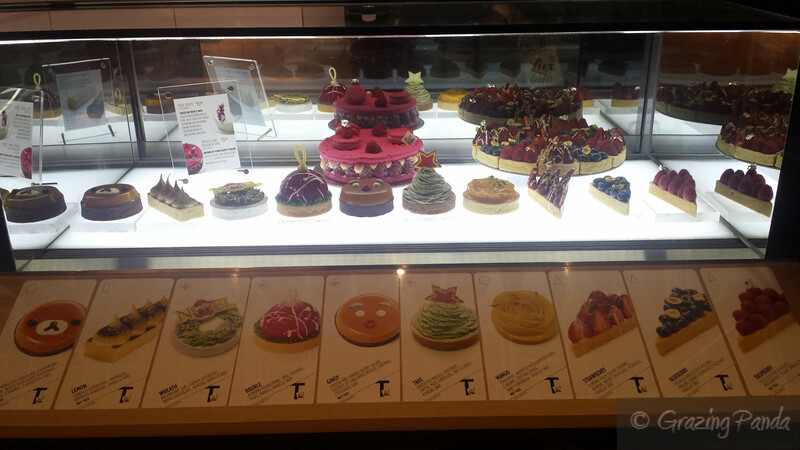 Dessert lovers will definitely enjoy this store – check it out now! I visited Jimmy Grants during a day off during lunchtime as I had heard about their souvas. Jimmy Grants is the latest opening from the Made Establishment group – which also consist of Gazi, Mama Baba, St Katherine’s and HellenicRepublic and headed up by none other than Greek King George Calombaris. 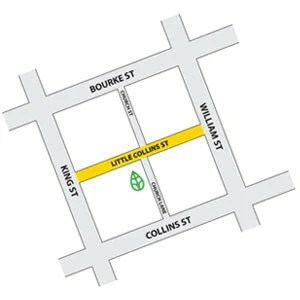 It is located in just off Smith Street in Fitzroy. There are more stores planned to open with one in CBD and one in Ormond. Another focus in the future is also to have a delivery service. The name comes from the rhyming slang name for the Greek, Italian and Middle Eastern immigrants to Melbourne and pays homage to them in the naming of dishes. For example the Patris is named after the migrant ship that carried assisted migrants from Europe to Australia – and is souva which comprises of prawns, attiki honey, mayonnaise, cucumber, mint and coriander. Yum! Jimmy Grants has a very short and concise menu which consists of souvas, rotisserie meats, salads, sides and of course dessert. The main focus here is on souvas (souvlakis) all of which are under $10. The souvas come in a warm and fluffy wholemeal pita which is stuffed with either free range chicken, lamb, prawns or falafel together with other additions that you would finding a souvlaki such as onions, parsley as well as delicious, crispy,crunchy chips! There are also the “Jimmy Dimmy” which is their take on the humble Dim Sim. I wanted to try this out but was too full after my souva so I definitely have to come back and try it out. In addition to the souvas, there are also salads available such as the simple iceberg salad with oregano, lemond and oil, the Hellenic Slaw with honey and Balsamic as well as a Grain salad that has a combination of pulses, nuts and grains mixed with parsley and Greek Yoghurt. You can also order either the free range chicken or the spit roasted lamb shoulder from the rotisserie together with pitas and a side (a kind of do-it-yourself souva if you will) at $15 and you can also add a salad or extra pita breads for an extra $5 – the choice is up to you. The menu of course has to finish with Desserts and these ranges from the Greek doughnuts with walnuts and honey (made by chef Travis McCauley), to a Greek Yoghurt, honey and white chocolate “choc top” as well as their version of the Wagon Wheel (filled with strawberry marshmallow (all of which are made by Darren Purchese). I ordered the chicken souva and it was quite tasty but slightly smaller in size than your standard kebab. I loved the addition of the chips for the extra crunch and the sauce used was delicious. Sometimes I found the chicken sizing to be too big to fit inside the kebab (but then again who would complain about that =p) The chicken is moist and tender at the same time and is flavoured perfectly. For dessert I ordered the Wagon wheel which was chocolate filled with a strawberry marshmallow gooey centre. It was decently sized as well and I couldn’t eat all of it in one go – but it was certainly just as delicious as biting into it the first time. The space in which Jimmy Grants was created was designed by Techne Architects and features low table seating in the front room, followed by high bar stools and high communal table in the back room. The historical and cultural references can be seen in the décor with splashes of the Greek blue against the white washed brick walls. There are also feature walls done by Dan Wenn which show a DC-3 aircraft as well as The Patris (the tall ship with silhouettes of friends and family waiting for their loved ones in the foreground). Jimmy Grants is a licensed bar, diner and takeaway all in one where the staff are warm, welcoming, friendly and funny! Jimmy Grants delivers quick, easy and tasty Greek food that doesn’t cost much at all. It’s a no fuss souvlaki bar which is soon to open up in other locations and I cannot wait for a branch closer to me. Service: Fantastic and Attentive. The wait staff are super funny as well!